Pete Convey is a terrestrial ecologist with 25 years experience of working with BAS and in a wide range of polar environments (15 summers and one winter south, multiple Arctic (Svalbard) field or teaching periods. He has broad and diverse research interests, with over 250 publications in these fields (current H Index 36). Pete is an ‘Individual Merit’ (IMP) senior research scientist (NERC Band 3) at BAS, working within the core ‘Ecosystems’ and ‘Environmental Change and Evolution’ Programmes. 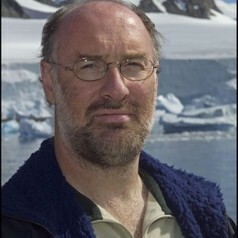 He is very active in the development of international Antarctic science priorities and collaborative research programmes through the Scientific Committee on Antarctic Research (SCAR), being Co-Chair of the SCAR Science Research Programme ‘Evolution and Biodiversity in Antarctica’ (2006-2013), and previously a founding member and steering committee member of the ‘Regional Sensitivity to Climate Change in Antarctica’ research programme. He is currently Chair of the SCAR Development Council. He has been an Honorary Lecturer at the University of Birmingham since 2000, and is a Guest Lecturer at UNIS, Svalbard, and a Visiting Professor at the National Antarctic Research Centre, University of Malaya, Malaysia. He was awarded a prestigious Erskine Fellowship to work at Gateway Antarctica (University of Canterbury, New Zealand) from December 2013 to February 2014. He has supervised nine (completed) PhD students and has ten current PhD and Master’s students, and is a STEM Ambassador (educational and public outreach). He has been an examiner for sixteen PhD and four Master’s theses. He has been a member of the International Steering committee of the 3rd, 4th and 6th SCAR Open Science Conferences (~1,000 participants), and the 10th and 11th SCAR Biology Symposia (~300 participants), and was Co-Chair of the International Scientific Organising Committee of the Fifth SCAR Open Science Conference. He is a member of the editorial advisory panel or Associate Editor for the journals Global Change Biology, BMC Ecology, Biodiversity, Polar Science and Polish Polar Research, and a guest editor for three journal special issues and three other volumes. He is a member of the SCAR Advisory Group on Antarctic Climate Change and the Environment. Awarded the UK Polar Medal in 2007, Pete’s professional standing is recognised by Membership of the Society for Biology and Chartered Biologist status, and by Fellowship of the Royal Entomological Society and Cambridge Philosophical Society.